Jarran Muse as Marvin Gaye & Cast. Photos feature the First National Tour cast © Joan Marcus. The lesser-known story behind the founder of one of the most influential record labels in history makes for quite the Broadway musical. Motown the Musical is captivating and enthralling from the opening number through the tribute mini-concert finale. The show is a sing-along for many and the music appeals to a broad spectrum of generational differences. As an audience member, I don’t think I’ve been to a show that was quite as universally loved by the entire audience, despite our differences. The show is fast paced and is almost exclusively music, with very brief interludes for connecting dialogue. It is a work of art the way the songs flow seamlessly together to create one story line. While by definition, Motown the Musical may be a “Jukebox” musical, I was hard pressed to find gaps in the storyline or any cheesy connecting dialogue. The words of Berry Gordy himself, and music from The Legendary Motown Catalog come together to create a story of determination and love, in the midst of the civil rights movement. 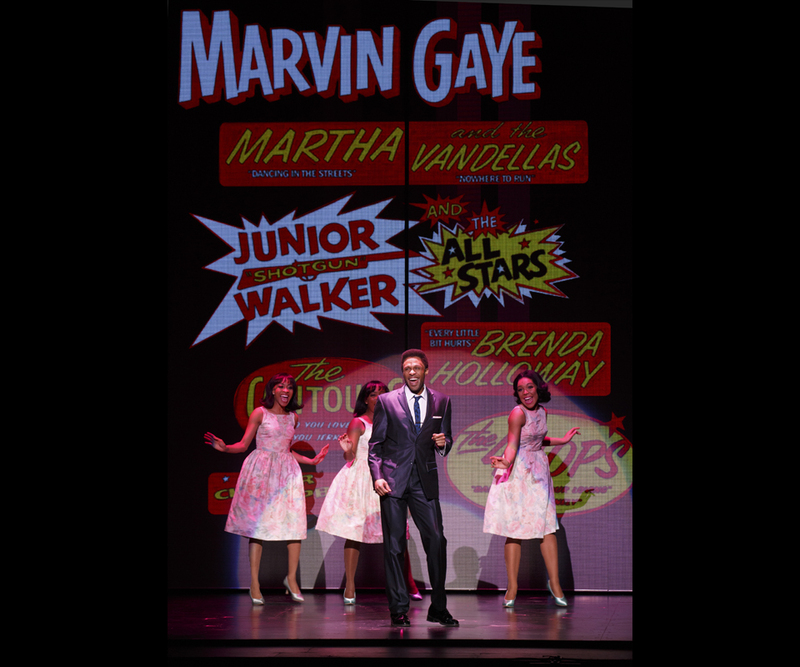 The audience is transported back in time and catches glimpses of some of the ups and downs of Berry Gordy’s life, his company and the very beginning of some of the most talented and influential artists of the latter half of the last century. The cast on this tour of the musical is nothing short of supreme excellence. Every single individual is perfectly cast for their role and the ensemble creates a realistic performance for each era of music portrayed throughout the musical, their flexibility will impress and delight. Chester Gregory as Berry Gordy and Allison Semmes as Diana Ross are both a joy to listen to but also create a believable and heartfelt performance of star-crossed lovers.Their love and frustrations in the face of fame will speak to relationships at all levels of longevity. David Kaverman and Jarran Muse as Smokey Robinson and Marvin Gaye respectively, each reveal more about the real-life people they portray than the average audience member will have known. Their voices will bring you back in time and their characters will make you chuckle: both bringing a sense of realism to the story, a perspective that perhaps, this really could have been how it happened. Lastly, young Raymond Davis Jr. (CJ Wright) absolutely takes the cake for stealing the show as a young Michael Jackson with the Jackson 5. His voice will make you crane your neck to see if it isn’t actually a young Michael Jackson on stage. He truly channels the King of Pop and the audience eats it up gleefully. The show is a must see for music lovers and anyone who appreciates seeing a truly dedicated and talented cast completely living in their element. A special recognition to Emilio Sosa who’s costumes are nothing short of dazzling. Motown The Musical is a show you do not want to miss. Performance dates are Tuesday, July 11 through Sunday, July 16, 2017 at the Orpheum Theatre with performance times on Tuesday, Wednesday and Thursday at 7:30 pm, Friday at 8 pm, Saturday at 2 and 8 pm and Sunday at 1 and 6:30 pm. Student and educator rush available.